It is easy to convert most of the fuel run vehicles into electrical ones, but there are a few cautions to be taken by a person, before going for such a change. The following are 3 things your chosen donor vehicle for your DIY electric car must be able to fulfil. 1) Donor car carrying capacity. First of all, he has to look into, whether the vehicle proposed for conversion has adequate capacity to carry the battery system that will have to remain as a substitute for fuel, to provide required energy for the vehicle. Here, there are two prime factors to consider before going for such a conversion. The first one is whether the vehicle’s suspension will be able to carry the weight of the batteries. This can be decided by bringing into use another type of battery, but everything will depend on your capacity to spend, as the most of the batteries producing higher density of energy, will be costing more. 2) Donor car space availability. The next issue is whether the batteries you install will have enough space to fit into the vehicle meant for conversion. For a proper range and acceleration required for your electrical vehicle, you will have to acquire about 20 numbers of 12 volt lead acid batteries, which require adequate storing space in the vehicle, for being fitted in a safe manner. It is for this reason that the light trucks are mostly preferred for electrical conversion and another ideal choice is the strong light sedans. 3) Donor car braking capacity. 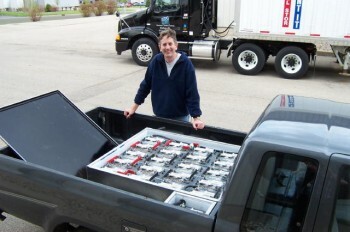 Another point of consideration here is whether the vehicle’s braking system is able to handle the additional weight of the heavy batteries being installed. This is a very crucial point for consideration because, if the brakes fail eventually, there will be a great risk for you and your family. Before going for installation of the batteries, the first thing you have to do is to calculate the net weight difference, after placing the battery sets, inside the vehicle. To accomplish this successfully, you need to know the total number of deep cycle batteries you have to bring into use and the individual weight of each one of them. Normally the suppliers will be able to give you the average weight. If you know the weight of the batteries and also the weight of the electric motor, these can be added and the weight of all the previously used gas components deducted from that total, to get the net weight. The weight of a full tank of gas and that of the radiator fuel has also to be similarly added. If you deduct the gas vehicle component’s weight from the total weight of the battery and the motor, you will be able to ascertain the net increase in weight. This way you will be able to decide what exactly will be the increase in the net weight and determine the quantum of impact that would have on the braking system. If the increase in the additional weight is substantial and over 500 pounds, it will be ideal to obtain the expert opinion of a brake specialist, in order to ensure that the braking system functions without problems. The emphasis here is that before converting a gas vehicle into an electrical one, the suspension capacity and the impact on the braking system have to be examined. This will decide the comfort of your electrical vehicle ride and the safety of the travel.